ABOUT REHEAT… So what exactly is this? so much for my New Year’s resolution of keeping up to date on posting new pieces! I have so many new things to share, will start with just a few more recent pieces. I’ve been having fun experimenting with 3-D bobbles, intentional holes!! and other surface designs. I’ve also been really enjoying using naturally dyed cheesecloth to add strength with the illusion of fragility. As the weather warms, I’m trying to get outside more often to take pictures of the work, sunlight is the best light box 🙂 Stay tuned for more pieces to come… new seal collars (beauty without cruelty! 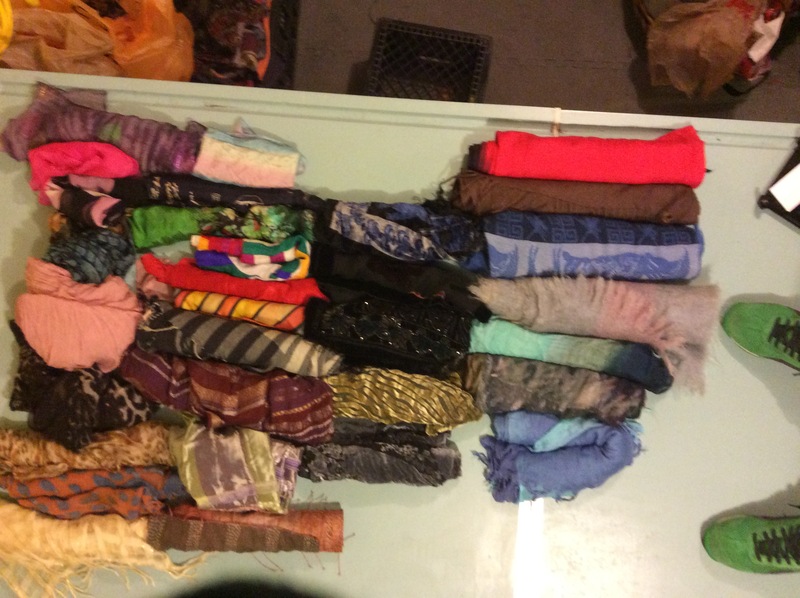 ), lighter than air summer shawls and other wearable art goodies. All of my pieces come with a story- from the origins of the vintage fabric, to the process and production of the wool, to the materials and source of embellishments and the creation of the closures (usually my sweetie). IMO however some of my latest pieces will be coming with the best story yet! I was very intrigued by a wooden box full of strange leather at the incomparable Plan B, a treasure trove of unique and unusual finds. On closer inspection, the leather, in a range of beautiful colours (beige, pink, red, purple and black) resembled snakeskin but had a more of an oval shape… like a fish?! There was also the most delightful smell emanating from the leather, a fresh and woody aroma. I brought some of the leather to Bob, the captain of Plan B and he explained that yes it was fish leather and it was locally produced.. and then he told me all about a bit of a political boondoggle in Nova Scotia’s economic past. As you are likely aware, Nova Scotia has a rich tradition of fishing and in the 80’s, the government of the day decided to invest heavily in a by-product of this industry, creating fish leather. A factory was set up and traditional Mi’kmaw tanning practices were adapted to cure the leather using sweetgrass (hence the amazing smell!). Sadly, the world wasn’t ready for fish leather at that point and the venture failed. Bob talked about how for years you would see these giant bales of fish leather in the strangest places but over time stock has dwindled. He hadn’t seen any for a long time until this batch came in. 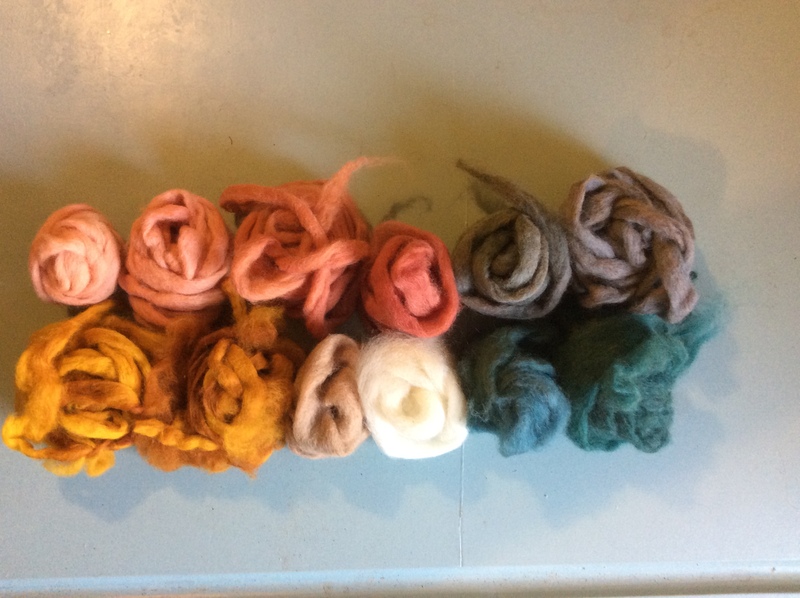 After hearing this story and seeing, smelling and touching the beauty of this local treasure, I knew I needed to incorporate it into my felt pieces. The first one I’m going to share is called “Selkie” as it incorporates all of the colours of the Atlantic Ocean. The body of the shawl is cobweb felt, embellished with firestar, sari silk and silk cocoon fibres. The shawl closes with a large piece of ebony fish leather and a button made from shed antlers. There are lots of different ways to wear this piece, could even be used as a skirt or wrap. 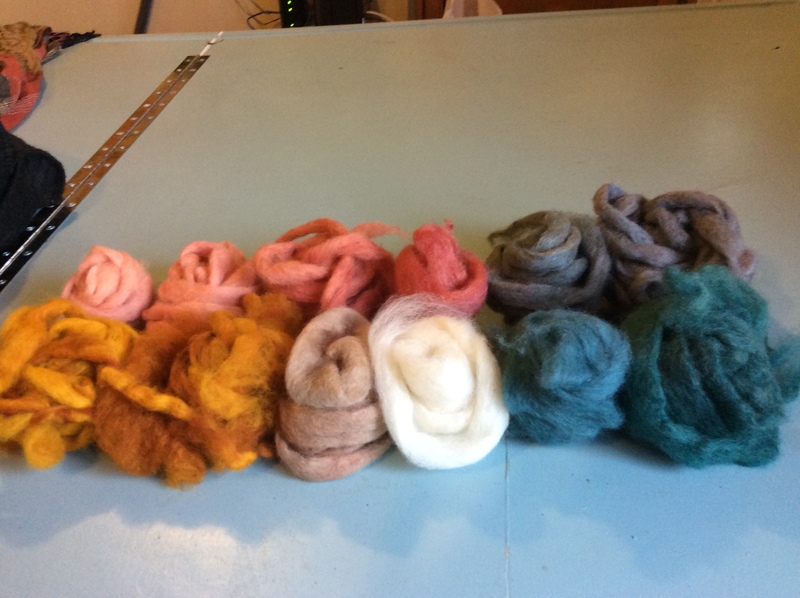 Felting in the heat of summer? Why not! It’s been far too long since I’ve posted pictures of my work, so here is some of the latest from the 2016/2017 season. I’m now working on new pieces for the fall, inspired by past favourites but always striving for new and exciting combinations. Stay tuned for new work and updates on where to find me in the Fall, including the Etsy Made in Canada- Maritime Makers event September 23rd at the Cunard Centre. Can’t wait!!! By the light of day?! In the ever elusive, ever continuing search for good pictures of my pieces… they always look so much better in person… I decided to try for an outdoor photo shoot today. The rain held off and my back deck proved to be a fairly warm springtime spot to unleash my inner photographer. I had some fun with creating a backdrop but I’m still not 100% pleased with the pictures, still a bit dark and not bright enough, IMO. Oh well, it was nice to get back into the old stock, air everything out and admire work done when there wasn’t time to step back and enjoy it. check out all my new products and drop by the show to see them in person! it’s that time of year again, I’m heading back to the Seaport this weekend for a full day of marketing on Saturday, come see me on the mezzanine, visitors are always welcome… Though you may want to hold off until my first coffee 😉 I’ve been busy making new pieces from my recent amazing local thrift store finds, see the picture for a sample of the incredible silks, velvet and hand-wovens I discovered… if only there was an emoticon for rubbing my hands together or maniacal laughter! I’ve also been thinking about how to setup my table this season, definitely want something colourful and fresh, have collected a few interesting display pieces over the winter. I’m also preparing for an upcoming huge show…. Stay tuned for the exciting details. And while it’s yummy and full of colourful goodness, I wouldn’t recommend digging in 🙂 I’ve been having so much fun with my plant based dye kit from Blue Castle Fibre Arts and with a ginormous bag of natural wool from a sweet little Cotswald ewe from Middle Sackville named Sweet Pea 😊 here’s a sample of all the beautiful colours coming from madder root, indigo, turmeric, soap nut and whole other bunch of natural dyes. 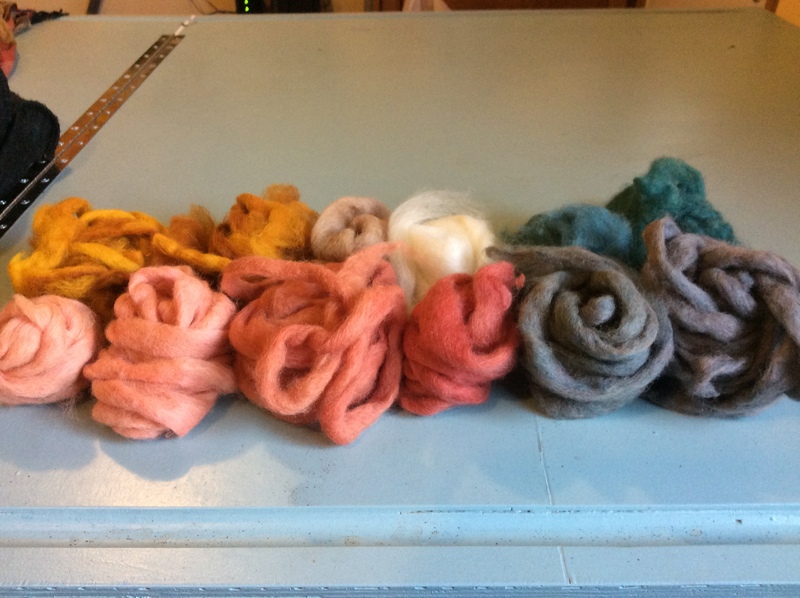 stay tuned for samples of new pieces using these lovely colours. Come see me on the mezzanine at the SeaPort Farmers Market, SATURDAY'S 7AM-3PM, usually between September to January. Alternatively, send me a message and arrange for a visit to my studio in North end Halifax or to your home.